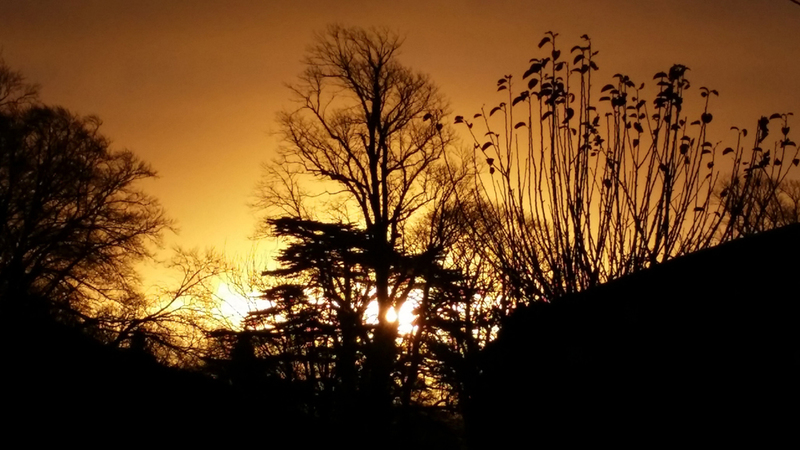 This was the beautiful sunrise at Maude & Fox yesterday morning. We were up with the sparrows sending out the last orders for Christmas! Happy Christmas everyone and we look forward to a tweedy 2015! From all at Maude and Fox. 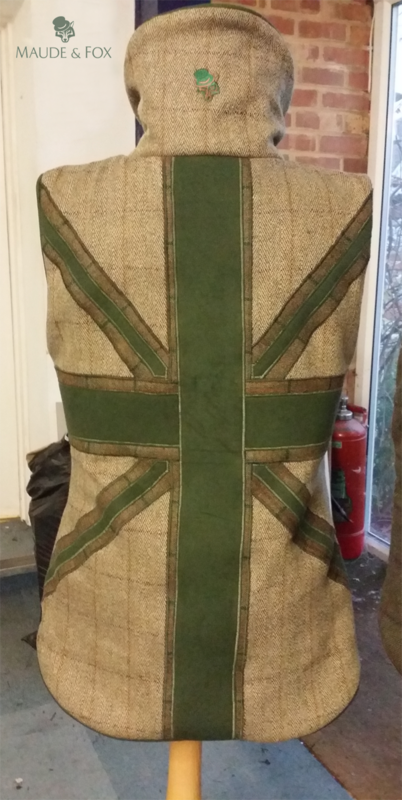 We love this bespoke Patriot tweed gilet, created for a stylish returning lady customer. Not only do the colours work really well together. They’re also perfect for beating at this time of year. You can see our standard Ladies Green Patriot Tweed Gilet here. It’s hand made in our Dorset studio and as with all our contemporary tweed clothing, we can work on bespoke designs if required. Our collection of ladies gilets currently starts at £139. 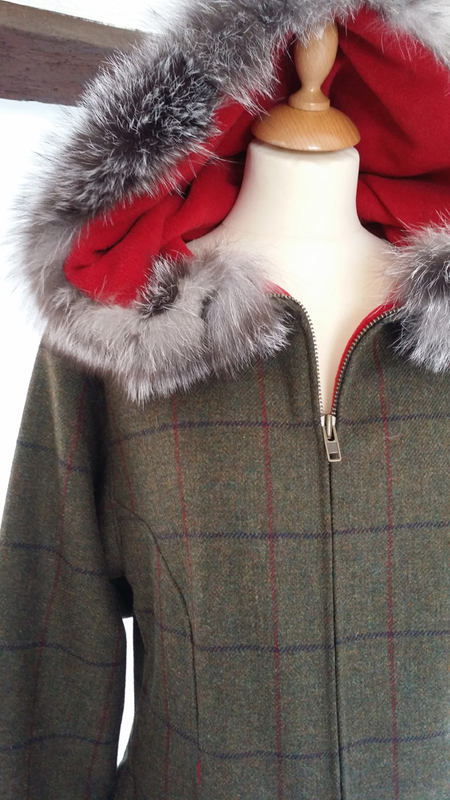 View our ladies tweed clothing collection. Here’s a photo of our new trainee Lesley at our Dorset studio. 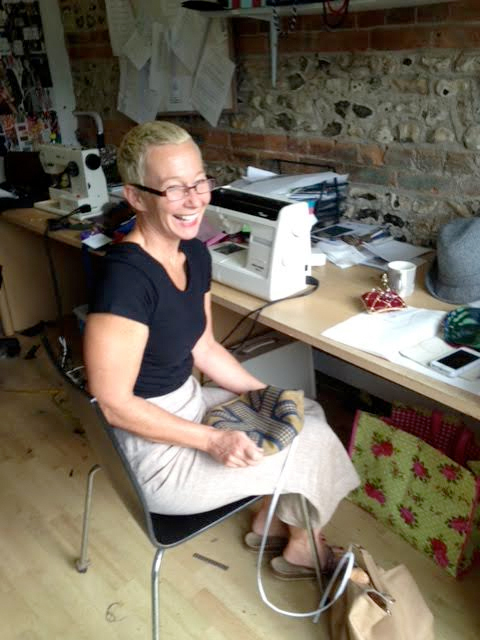 Lesley is pictured working on a new tweed cap that we are going to trial at next weekend’s Country Life Fulham Palace Show. We’re going to call this patriot style cap the Fredster. 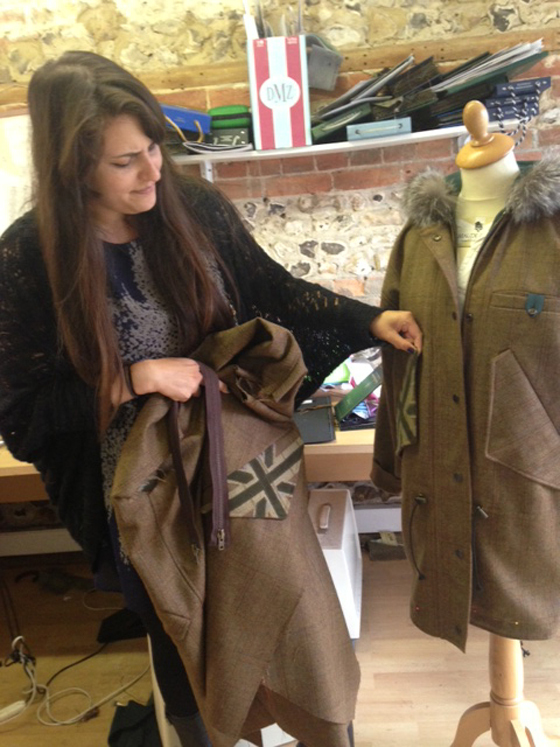 The Maude & Fox team are busy creating new Nosy Parkas in our Dorset studio this week as we prepare for the 2014 Chatsworth Country Fair that takes place this weekend. The Nosy Parka is a traditional fishtail parka with our classic tweed twist. It features a rusty brown tweed with a bottle green quilted fleece lining. It has a looser fit with drawstring details around the waist and tail – perfect for keeping snug and warm, especially with Autumn just around the corner. We wanted to keep a simple cut to the garment but still include lots of attention to detail. These include the patriot flap, the hidden fox logos and a patch pocket on the left arm and inside pocket. Try one on for size this weekend or alternatively purchase one online here. We’re really looking forward to tomorrow’s CLA Game Fair. Not only is the event great fun, this year we will be debuting three brand new items; The Nosy Parka, the Patriot Scarf and this fitted ladies jacket that we’ve named ‘the Fly’. The Fly jacket is shown in our Henley tweed with an eye-catching and super-soft red fleece lining. Tailored for a flattering ladies fit, the Fly also features adjustable straps at hip. A second version called the Fur Fly will be available with a silver fox fur trim. 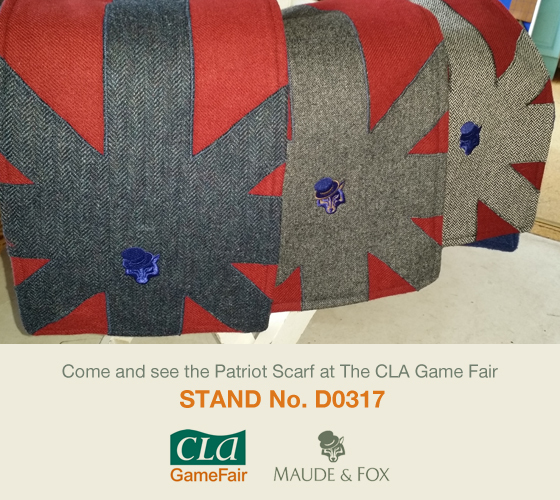 See it for yourself at the 2014 CLA Game Fair (Maude & Fox will be on stand number D0317). The Fly will be also be available to purchase online very soon via our Ladies Country Clothing page. The Fly jacket is now available online at Maude & Fox. Another brand new item making its debut at this weekend’s 2014 CLA Game Fair is our Patriot Scarf. The Patriot Scarf features a deep red tweed with blue herringbone appliquéd over the top and a soft blue fleece lining. Perfect for keeping a stylishly warm once the A/W season arrives. The Patriot Scarf joins our our current Patriot line-up that includes the popular Mapperton Patriot Hoodie, the Gentlemens Gilet, Ladies Green Patriot Tweed Gilet and the Patriot Cap. Be one of the first to see this scarf at the CLA Game Fair. 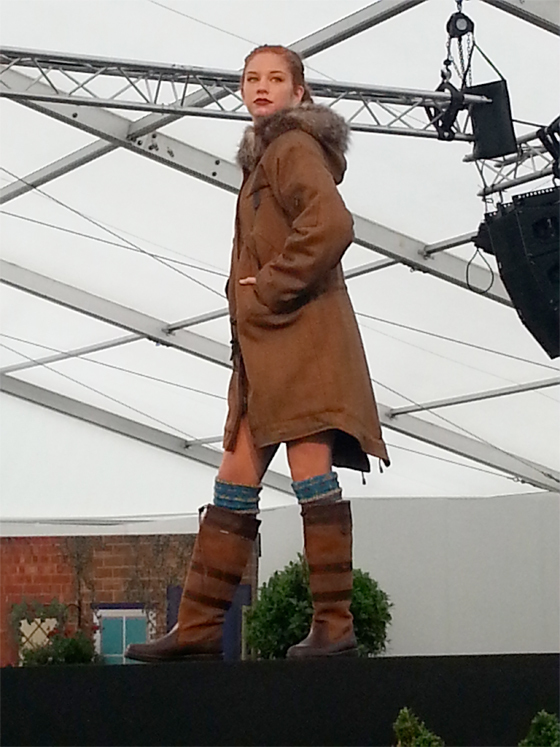 You’ll find the Maude & Fox team and our tweed collection on stand number D0317. Hello from Maude & Fox - we like to keep everyone up to speed with what we're doing, product development, shows, customer feedback and general news. Please have a squint at our blog and do drop us a line if there's anything you'd like to know. Get all the latest blog posts directly to your Email inbox. Get all the latest blog posts in your favourite RSS reader.